I had never had so many near misses as I had on the roads in Greece. As I explained in the story of my trip through the Balkans, Greek drivers are the epitome of all types of bad behaviour on the road – they do not mind their surroundings, use their mobile phones while driving, run stop signs, ignore right of way… and worst of all, they are incompetent drivers. They floor it on straights but can’t keep a decent speed through a corner, they don’t seem to be able to judge speed and distance accurately and they have total disregard for other users. A testament to the consequences of all of this can be found everywhere in the Greek road network. I crossed the border from Bulgaria in a small crossing and took regional roads on the Greek side, a beautiful route going down the mountains. 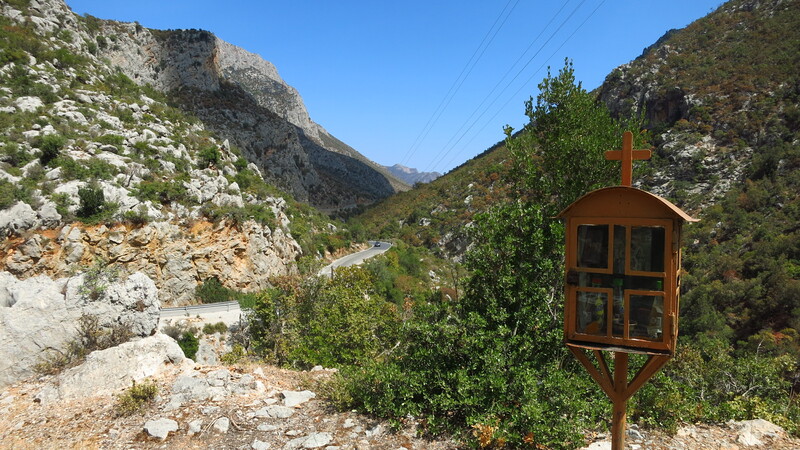 It was not long before I saw a small shrine by the side of the road, at the exit of a tight corner – it looked like a miniature church on a stand, and had fresh flowers on it. The flowers and the location made me think that it was there to commemorate the victim or victims of a road accident, in the same way that some people leave a bunch of flowers attached to a signpost or an Armco barrier in other countries. But then, a few corners down the road I saw another one. And another one. And another one. Some were quite new and well taken care of, some were older. The varied in size and complexity, some were made of stone, some were made of wood or iron, and all that remained of some were a few pieces of wood or metal hanging from a pole. They were everywhere, there was practically not a corner or crossroads without one on them, and I started to ride more slowly, more carefully, afraid that if each one represented an accident, I was on the deadliest road in the world. They were a constant presence in my trip throughout the roads of Greece. I later discovered that they are called Kandylakia and do not always represent a road death – they are also built to express gratefulness at having escaped or survived and accident, but even if they are not always associated to a tragic ending, the sheer number of them bears witness to the dangers of driving in that country. This entry was posted in Balkan Adventure 2016, Travel and tagged Greece, Honda CRF 1000L, road shrines by Kilian. Bookmark the permalink.